Toyota City, Japan, October 14, 2015―With the aim of contributing to global environmental sustainability, Toyota has developed an ambitious set of goals to be achieved over the next 35 years. 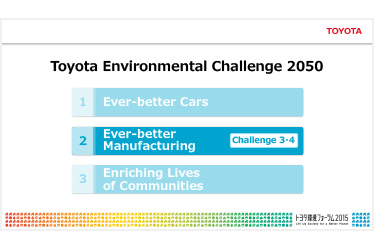 Addressing key global environmental issues such as climate change, water shortages, resource depletion, and degradation of biodiversity, the Toyota Environmental Challenge 2050 aims to reduce the negative impact of manufacturing and driving vehicles as much as possible. The challenge is composed of six individual challenges across three areas: Ever-better cars, ever-better manufacturing, and enriching lives of communities. 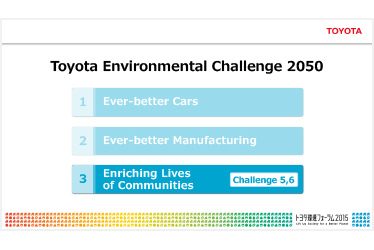 In addition, as a key step toward achieving these long-term targets, Toyota is announcing its Sixth Toyota Environmental Action Plan, which will be enacted between April 2016 and the end of March 2021. 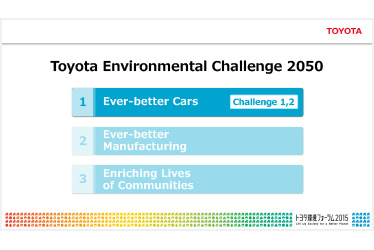 Some specific examples of Toyota's efforts to meet these ambitious targets are given below. Developing next-generation models based on hybrid technologies, which encompass all of the component technologies necessary for the development of environment-friendly cars and which facilitate the use of different fuel combinations. Promoting the downsizing and improvement of power control units in hybrids and PHVs, etc. ; focusing development resources on the commercial application of silicon carbide power semiconductors (jointly developed with Denso Corporation and Toyota Central R&D Labs., Inc.) that can improve the fuel efficiency of hybrids by 10 percent. A series of mutually affiliated tree-planting and habitat restoration and preservation activities run by Toyota and Toyota Group companies. Cooperation will be sought from local governments and businesses, as well as suppliers and sales companies, to expand the scope of activities and contribute to improving the natural environment. This project will draw on Toyota's experience in planting a cumulative total of 8.6 million trees over more than 10 years in Hebei Province, China, which is suffering from desertification, as well as at Toyota plants in Japan and other countries. Challenge for "Enriching lives of communities"